If you are looking for a quiet place in nature, but still close to Bled and Bohinj, then this is the place to be! This farm is quietly located near the village of Bohinsjka Bela (2.5 km) and is set 900 meters above sea level. 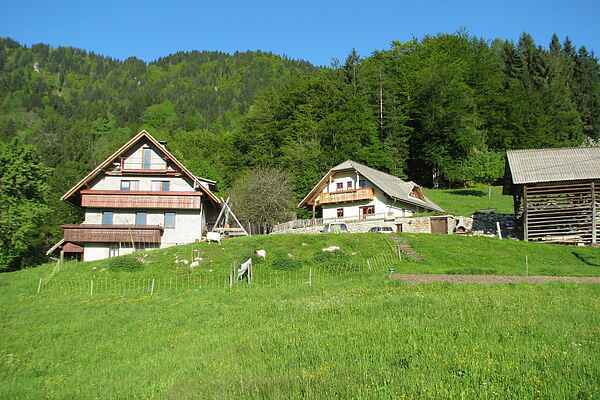 From this place you have a beautiful view of the Bled valley and the surrounding forest. Bled and Lake Bled are a 10-minute drive away and Bohinj Lake is 30 minutes away. On the shared plot there is a playground for the children and farm animals such as cows, goats, rabbits, chickens, dogs and cats inhabit the grounds. Horse riding can be organized by the owners on request. A small supermarket and restaurant can be found in Bohinjska Bela. Your apartment is situated on the attic and consists of a living room with sofa bed, a kitchen with dining table, two bedrooms, a bathroom and a balcony. The last 900 m to the house are via a steep and unpaved mountain road. During the winter months there is occasional heavy snow fall in this area. Pet on request.